Russia launches 5th generation fighter jet – Royal Times of Nigeria. Russia: T-50, fifth-generation fighter jet. Russia has successfully completed the first set of flight tests of its T-50, fifth-generation fighter jet. The Aerospace Forces Commander Viktor Bondarev confirmed the successful tests on Friday. “Today is a historic event — a preliminary conclusion has been signed at the MAKS airshow on the first stage of the flight trials of the T-50 prototype. “We are now switching to the second stage of trials. We have also been recommended to start the manufacture of the plane’s pre-production batch,” Bondarev said. In an interview with Sputnik, Dmitry Drozdenko, a military expert with Arsenal of the Motherland journal, said that he had been greatly impressed by what the T-50 PAK FA jet had demonstrated during the MAKS-2017 airshow. “This is indeed a groundbreaking event because we are the second country to start the serial production of fifth-generation fighters. What the T-50 demonstrated at the MAKS show, especially in terms of maneuverability, simply blows the mind!” Drozdenko shared. “I have seen the US F-22 at Farnborough air show in Britain and it was not even close to what I saw here,” he added. He also explained why Russia’s T-50 is better than its US counterpart, the F-22 Raptor. 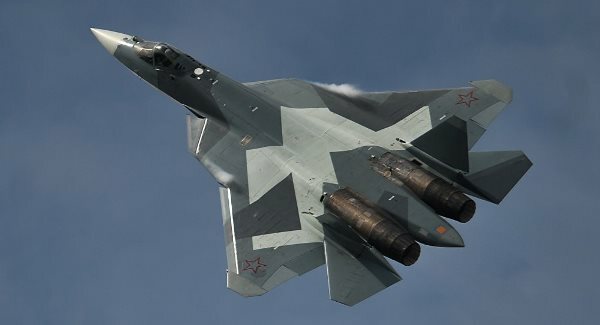 “The F-22 Raptor is the only foreign counterpart that can stand up to the T-50, but the T-50 is a newer design and is more technologically advanced,” Drozdenko said. “Well, the T-50 may have some flaws too that don’t meet the eye, maybe when it comes to on-board electronics. However, this is something we don’t know about the Americans either, do we?” the expert noted. The T-50 will also feature a “nervous system” designed to improve flighty safety. According to the system’s developer, the Russian Foundation for Advanced Research Projects (FPI), it is based on the principles of operation of living organisms’ nervous system. FPI presented a mock-up of the advanced PAK FA fighter, made of composite materials. The T-50 PAK FA (Perspective Airborne Complex of Front line Aviation) fighter jet was designed by the Russian Sukhoi aircraft manufacturer as part of a fifth-generation fighter program of the Russian Aerospace Forces. It is a single-seat, twin-engine multi role stealth fighter jet designed for air superiority and attack roles and equipped with advanced avionics system and airborne active phased array radar. It is to replace the Sukhoi Su-27 fighters, in service since 1985.